This project was founded with the cooperation of the "Universidad Nacional de Costa Rica" and the "University and research Centre Wageningen" in Holland. The Foundation Iguanaverde is registered in Holland and is a non profit organization. Don't extract plants or wildlife animals. The Tree House Lodge doesn't comercialize species or flora and fauna products that are ilegal by law. Want to be a helpful hand to this noble foundation?. Click the button below and participate with a donation. 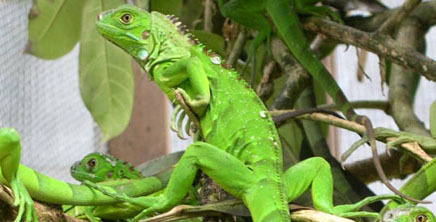 Iguanaverde is intended as a source of information about the situation of the Green Iguana in the Southern Caribbean Coast of Costa Rica; where survival of the iguana is threatened by the presence of unscrupulous individuals as well as traditional hunters and slow climatologic changes. Learn more about Iguana Verde Foundation.